Sometimes Christmas sneaks up on me and the Christmas cards aren’t sent in a timely manner. Maybe it has happened to you too. Perhaps you’ve been ill or had to work extra hours at your job or had some other disruption to your plans. Here are some ways to deal with tardy holiday cards. Just posting “Merry Christmas” on your Facebook status is a little lame. It’s better to compose a reasonable Christmas letter that’s newsy and send it using Facebook’s message capability. Hopefully, you have unlimited long distance calling on your phone because this is the way you can reach all your offline friends. It takes time to ring them all up and have a good chat, but that’s what happens when you don’t work on your Christmas cards earlier. This is an alternative to the first three suggestions. Send the cards with a “Happy New Year” or “Best wishes for a great year” penned in after the Christmas greeting. Try to get them in the mail right after Christmas. You can get away with this if you are right in the middle of moving, getting a divorce, have been sick, or are coping with a major family upheaval. Next year, send your cards early and explain what happened. Cindy Ross, our guest blogger for today, is Gail and Clyde Martin’s fourth child. She shares her Christmas memories with us. “As a child, it seemed to take forever for Christmas to arrive. I remember the anticipation while waiting to open gifts early that morning. It could be very cold if Dad hadn’t stoked the fire in the potbelly stove. So, if you arrived downstairs too soon, you’d be scampering back to that warm bed. Our stockings hung along the staircase and you could almost peek into them from up above. We were lucky to get an apple or orange, ribbon candy, or a candy cane. I loved the wooden bowl Mom placed on the table holding the English walnuts, cashew, Brazil nuts, almonds, pecans, and peanuts to be cracked open. The slender metal picks in the center of the bowl helped get the nutmeat out of the shell. This is what the nutbowl looked like. Comment from her older sister, Ginger: “Thanks, Sis, for writing this. I’d forgotten where we hung the stockings and about the bowl of nuts. Now, I remember how exotic those nuts seemed and how difficult it was to crack the hard shell of those Brazil nuts. There were hazelnuts too. Christmas was the only time we had those. This is a variation on an earlier post. Gail often reworked a topic for publishing in other places. This appeared on Squidoo’s website. Some of these gifts are ones you can get ready the day before Christmas using what you have at home. Seniors can find gift-giving occasions difficult when their budget won’t stretch to buy one more thing. Here are some gift ideas that won’t put a strain that Social Security income. Most of these I’ve tried out myself and can assure you were well-received. A little imagination and a lot of love will make your gift the one they treasure. With six children, eight grandchildren, and many great-grandchildren, the Christmas and birthday gift giving was a challenge. Seniors living only on Social Security must apply creativity in their gift giving to keep it affordable. Think about things you have stashed away unused. We no longer decorate a tree at Christmas, but we still have boxes and boxes of special ornaments. I can give one to each person on my gift list. I’ll gain some storage space and they’ll gain a family heirloom for their Christmas tree. Write down a special memory of the day they were born or about something you did with them or their parent. Print it out or write it by hand on nice paper to give them. Slip it in a plastic sleeve to preserve it. If you write a new memory for their birthdays and Christmas, eventually they will have enough to fill a binder. 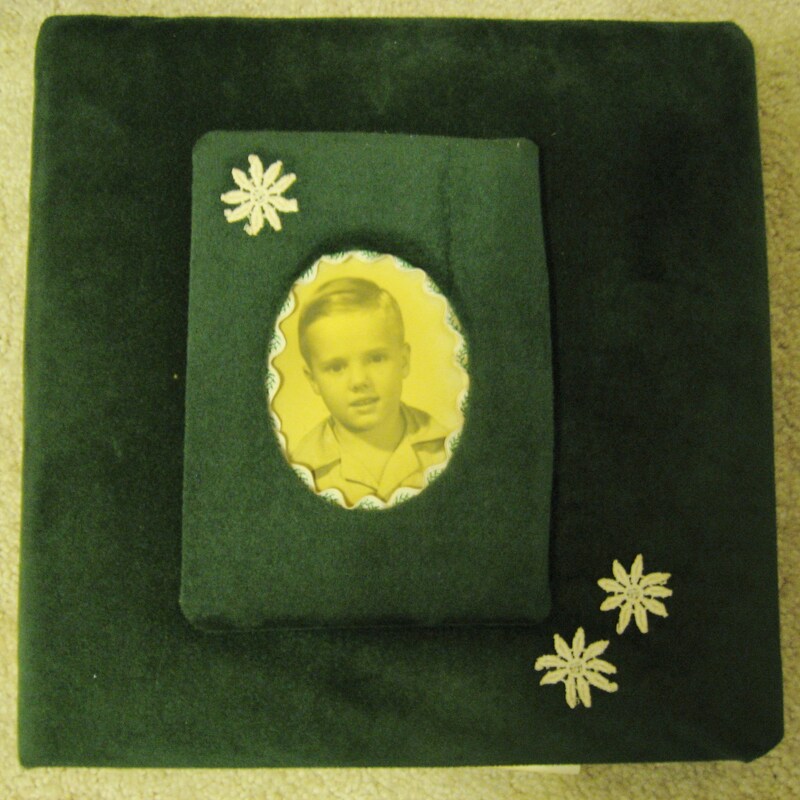 A family history notebook created by Gail Lee Martin for her son, Owen. Look on your bookshelf. Is there a book there that has special meaning to you? Write a note explaining what is meaningful to you about the book and give it to someone on your list. They will enjoy reading it, knowing that you selected it especially for them. Books on Clyde and Gail’s bookshelf. Make up a batch of your popular candy or cookie recipe and package it up to give to the children and grandchildren. Just a small amount on a paper plate (dessert size) and covered with plastic wrap lets them know you were thinking of them. Attach the recipe to the gift. To make it extra special, put them on a plate or platter that has been in the family for many years. They get a family heirloom, some of your great cooking, and you gain some space in your overcrowded cupboard. Look at your collections. Chances are you aren’t adding to the collection anymore. It may be just one more thing to dust. We collected Norman Rockwell mugs for many years. If we give one to each family member, they will think of us each time they use it. We also collected Feather Bird Pictures. They used to cover the wall of my dining room but now sit in a box in the closet. Another thing I collected was vintage aprons. I used these when giving a talk to homemaker groups or at nursing homes. At some point, you may decide not to keep a certain collection anymore. Consider giving them as gifts to family members. Even if you are not on a Social Security budget, you might want to try some of these ideas. 1angelsbestkeptsecrets Mar 27, 2014 – What wonderful ideas! I think the sentimentality and specialness of gifts like this would please most all family members. karendd123 Nov 26, 2013 – These are really good ideas. They are thoughtful and economical. Growing flowers from seeds or cuttings can make good gifts too. ewyorkdude Oct 14, 2013 – I can’t remember the last time I bought a greeting card. Homemade greeting cards make a much better impression than the store-bought kind. Most people tend to keep them longer. I will never be a professional artist (my work is more like Picasso on a bad day). But no matter how awkward my drawings are on my cards, people appreciate them. rinMellor Oct 11, 2013 – These are wonderful ideas. A few handwritten family recipes would be a real treat too. knowledgetoday Oct 08, 2013 – I think the greatest gift from grandma or grandpa to family members or friends is memories brought together in a creative way. And if creativity is not available giving a gift of what the other person has wanted for many years means much to the receiver. MarcellaCarlton Oct 01, 2013 – I loved each idea! This is a great lens for those of us who are experiencing the pinch at any time. Cercis Sep 30, 2013 – What a wonderful lens! I like the memory book idea the best. Another thought is to shop at a thrift store – either neighborhood or one of the more established ones – to pick up almost new items for pennies. WhyCleanCounts Aug 05, 2012 – great ideas, good lens topic for anyone that needs to stick to a budget around the holidays. dpgibble Jul 06, 2012 – I was exploring Squidoo for ideas when your page caught my eye. Curious, I stopped and found a direct connection to vallain who was the first or one of the first visitors to my first lens. Since our family survives on disability income along with a dollar here and there that we hustle up, celebrating Christmas on a budget piques my interest. We picked wild grapes last year and made pint jars of jelly from them. This produced about two dozen gifts with cash out at less than $25. People really liked this gift! Gail-Lee-Martin Jul 06, 2012 – Homemade gifts are the best, in my opinion. LiteraryMind Mar 16, 2012 – Good idea. Meaningful gifts are more special than anything money can buy. MiddleSister Feb 21, 2012 – I like the cookies idea. Gail’s daughter, Virginia, shares a memory. The play food for the play kitchen started out as real food for the family. 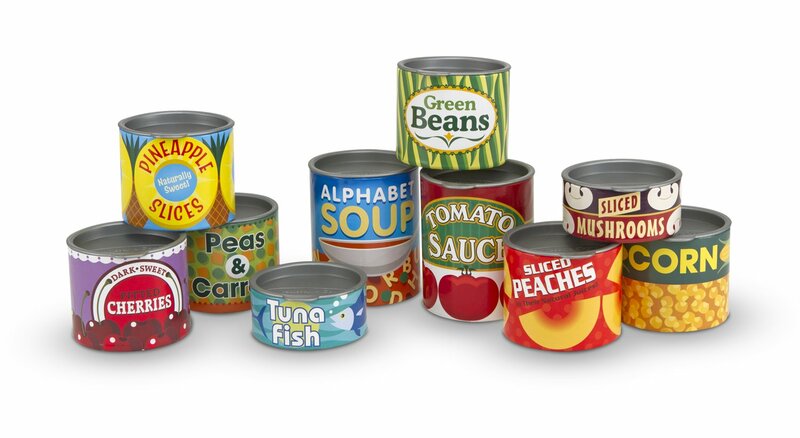 When Mom shopped for groceries, she bought small sizes of boxes and cans of regular food. She opened the cans from the bottom and washed out the interior. They looked like child-sized versions of real food sitting in the play kitchen cupboards. Nothing was wasted, as we ate the food. There were small cans of fruit juice and single-serving boxes of raisins. I still remember how much fun my sister had playing with those cans and boxes and her cardboard appliances. The empty containers looked colorful and realistic on the shelves. The house we lived in then had a large basement, so there was plenty of room for the kid-sized kitchen down there. 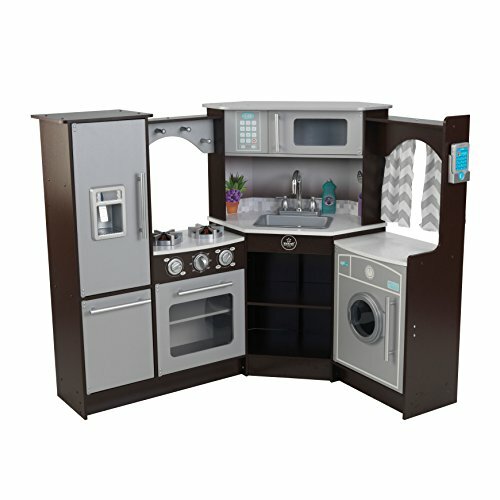 The play kitchen and play foods above are available from Amazon. Of course, you can just make your own, like Mom did for Shannon. In May of 1942 I graduated (barely) from Hamilton High School in Greenwood County, Kansas. I lived with my folks in the Seeley school district where Daddy worked as an oil field pumper for Phillips Petroleum Company. By the time school started in September I was offered a job caring for three-year-old Ann Neumayer and doing light house work for her family. 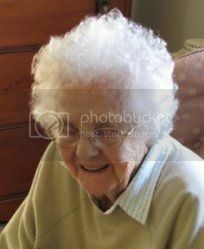 Her mother taught at the Seeley grade school, her dad was a pumper for the Ohio Oil company, and she had an older brother, Robert and an older sister, Peggy, who went to school with their mother. Hamilton High School in Kansas where Gail Lee McGhee graduated. At the start of the next school year, Mrs. Neumayer was allowed to take Ann to school with her. So I was wondering what I was to do, then we heard about the government’s NYA program for the young people of America. The closest school for girls was at Winfield, Kansas. My folks agreed for me to go and they took me down there. My boyfriend, Johnny Faylor, had been sent to Fort Leonardwood for training in the army. Our friend Clyde Martin was rejected when he was called up because he was a farm boy and was needed on the farm as his older brother, Ralph was already in the air force. He went to the boy’s camp in Cherryvale and took welding classes. 1942 postcard of Cherryvale, Kansas’ downtown. Due to politics and shortage of funding the NYA closed down July 12, 1943, just a week or two after I arrived. Most of the girls decided to take the bus to Wichita and try to get jobs in the aircraft factories. I went with them. I was lucky and got a job with Boeing helping build the B-29s in the electrical wiring department. I was thankful that Boeing was not union! After all the Phillips employees trouble with City Service union guys, I didn’t want anything to do with unions. I found a room in a castle looking house at 1313 N. Emporia. I was on the second floor and in the north turret. The biggest problem was having to go downstairs to the basement for the communal bathroom. Photo by Karen Kolavalli. The rooming house that Gail Lee McGhee stayed in during WWII while working at Boeing. My paycheck sure looked good but the money disappeared so fast. I had to pay for my room and all my meals plus bus rides to work and back. No matter where I went I had to ride the bus or walk. The winter approached and I had to buy a warm coat, mittens and a stocking cap that would pull down around my ears. I bought a few things for Christmas presents but also had to save money to buy my bus ticket to Emporia in Lyon County for the holidays. My parents and little sister, Carol drove up from our home in Greenwood County to Emporia to pick me up. Being with my loved ones was so good that I do not remember what gifts were given to whom. After working in the electric wiring department for several months I became unhappy when the inspectors ran a slight electrical charge to see if my work was OK. They didn’t tell me when they were going to do it and I became scared that the charge might get stronger so I asked to be transferred to another department. The next department was in the tool shed, where the employees checked out tools they needed to work with. I enjoyed this after learning what each tool was called and where each was stored. It was kinda like working in a library only at the end of the shift all tools had to be checked back in and I had only a short time to get them put where they belonged before I could check out. Gail Lee Martin first published this article on the eHow website some years ago. 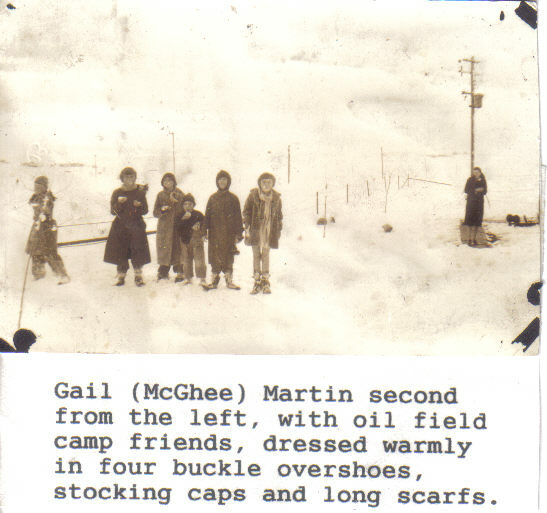 Here’s how to celebrate Christmas just like a prairie family in the 1930s. If you want a Christmas with an old-fashioned feel, just try the steps below. THE TREE: The arrival of our Christmas Tree was the beginning of the holiday season for my family. I remember the first time I experienced the thrill of going with Daddy to locate an appropriate tree for Christmas. On a nice sunny Sunday after a heavy snow and shortly before Christmas, Daddy would have us bundle up warmly in four buckle overshoes, hand knitted mittens, stocking caps and long scarves wrapped around our necks. Then we would follow in his footprints as he trekked through the snow-drifted Bluestem grass to a canyon in the fold of the hills almost a mile from our home. Scattered along the rocky sides of the canyon were many cedars of all sizes. We would select a well-rounded tree about my height. After scraping the snow from around the tree, Daddy dug out around the tree roots. The snow kept the ground from being frozen solid, so the digging went well even in the rocky soil. Daddy carefully packed the tree in a container and placed it on our small sled. We would take turns pulling our treasure home. This living tree stayed on our front porch until the day before Christmas. 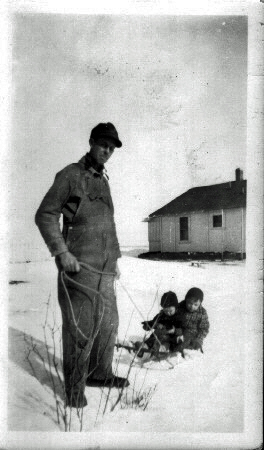 Clarence McGhee pulling toddlers on a sled. Kansas Flint Hills. CRANBERRY CHAINS: When the Christmas season neared our home on the snow-covered prairies, our house would take on a cheery atmosphere as we began making lustrous long, red garlands using fresh, whole cranberries. We would thread a large darning needle with string from Mother’s string ball. Our mother saved string through the year. Every time Daddy opened the hundred pound cotton sacks of flour or chicken feed, Mother would unravel the string that the sacks were sewn shut with, to add to her ball. POPCORN STRINGS: Stringing cranberries and popcorn took many long hours to get the strands long enough for a big tree. But the evenings of family togetherness around the living room stove were lots of fun as we enjoyed big bowls of popcorn drizzled with golden home-made butter. Daddy was in charge of popping the corn, that he had grown and as we munched, we would carefully thread unbuttered kernels into white garlands to drape in contrast with the ruby-red cranberries. SILVER STARS: Then we made bright silver stars. We would go to Mother’s hoarding drawer and get our small supply of foil we’d saved from spearmint chewing gum wrappers. Back then each stick of gum was in a foil and wax paper wrapper and we had to carefully peel them apart. With the resulting thin silver foil we covered cardboard stars cut from the backs of our Big Chief writing tablets. The first one we made was a large star that went on top of the tree each year. We covered smaller stars to hang here and there on the tree. With the darning needle, we would poke a tiny hole in one point of each star to thread a piece of string to hang them with. Each year we were able to make a few new ones. PAPER CHAINS: Mother showed us girls how to cut magazines ads and turn them into glossy, paper chains. We would cut many rectangles, one-half by five inches long, from the colorful ads. Then we would start by making a loop by lapping the ends and sticking them together with paste, we made from flour and water. Next, we would loop another strip of paper through the first loop, then pasted the ends and so on until the gleaming chain was the length we wanted. Draped in scallops on the tree or across the windows they were eye-catching. DECORATING: When he brought the tree inside and placed in the living room corner, the day before Christmas, we would transform it into a shimmering dream with all the scallops of red berries and white popcorn and little silver stars. In between, we arranged the glistening paper chains. At the very last, Daddy placed the large star at the top and our plain old Kansas cedar tree was a sight to remember. Best of all, it didn’t cost very much, just the cranberries had to be bought. AFTER CHRISTMAS: The week after Christmas we removed the stars and stored for another year. Then Daddy moved the tree to the front yard where we could watch the brave winter birds feasting on a banquet of popcorn and berries. Each year Daddy replanted our Christmas trees to make a much-needed windbreak and shelter for the birds. Gail Lee Martin posted this to the Our Echo website in 2011. Here it is for your Christmas reading enjoyment. If it triggers some Christmas memories for you, please share them in the comment section at the end. The advent of the TV in our home happened the first Christmas we lived on the Greene farm three miles north of El Dorado. This was in 1960 and Clyde had a good job and working regularly so we decided to get a brand new television for a Christmas for a present for all our six kids! We keep it hid in that old garage under some junk until Christmas morning. Clyde and I went out and brought it in before the kids woke up. We had an end table to put it on and one of us had the idea that we ought to have it turned on when the kids got up. So making sure the volume was turned real low we turned it on. Now remember it was Christmas time and colder than blue blazes outside. Clyde and I were really excited as we turned on the TV on and snap, crackle, and pop the cold tubes broke as the hot electricity hit each tube. What a bummer of a Christmas this was for the Martin family as we hadn’t bought anything else for anyone. All they had was their filled up stockings. But the kid’s Dad came to the rescue and wrote down the numbers from each broken tube and as soon as the stores opened he went into the Graves Drugstore on the west side of north Main and was able to buy every TV tube we needed. He came back home and replaced the burned out tubes and put in the new ones and PRESTO we had television to watch for Christmas. I know it is hard to believe this but that was the way TVs were built back then and not every store closed even on Christmas. Totally different world 50 years ago.